Let’s get right to it. Tires are a very important part of R/C Drift. If you are already into the scene, you know that it affects just about everything with your setup. So we take tire choice and changing our spec tire very seriously. We had been testing tires for approximately 4 months before deciding on a tire we felt fit our needs. The time is finally here, so get ready for the switch. So why did we do it? In short, everyone is just too fast. We aren’t speaking for everyone in the scene, but as far as everyone who slides here at Super-G, we feel the speeds have gotten out of control. It has shifted from smooth and stylish to an all out drag race with drift rules. From the day we opened Super-G we have been chasing the perfect tire. Cars get better, tuning styles change, tuning skills increase, and ultimately the cars gain more traction and speed. The tires we used a few years back have so much traction, todays cars aren’t even fun to drive with them. It is a constant challenge to find that right tire. Depending on the surface, tires react differently. This has proven to be challenging since we will get a tire from a certain manufacturer and it is ALMOST what we are looking for. Let’s say it’s just slightly too fast, so we will request their next 2 slower tires. According to their findings, they will send us what they feel will fit our needs. As we get to testing, we sometimes would find what they find is slower, ends up being faster for us. Strange but very common. Our last Spec Tire was Yokomo DRC all around. They provided a very good balance of forward and sideways bite. This is sometimes hard to find, depending on the material, design, and profile of the tire. We have been very happy with the DRC, but it was always a little on the fast side for our liking. Our new Spec Tire choice is the DS Racing – RWD FFFF Zero Mark II. It provides a very good balance between forward and sideways traction, but at slower speeds than what we are seeing with the DRCs. The break-in time seems similar to the DRCs also. At about 25-30 minutes the traction seems to stabilize, but seems to continue to gain more traction for another 30 minutes of driving, but is not that drastic. Why not just run fast with high traction? We feel that although it can be fun to drive with a lot of traction, it does hide a lot. Tuning a chassis with less traction becomes more challenging, but makes for better tuning skills. Driving with less traction becomes more difficult, but forces better technique and throttle control. Ultimately helps to build better skill in both areas. We are confident this change will help further the skills of everyone who slides here at Super-G R/C Drift Arena. 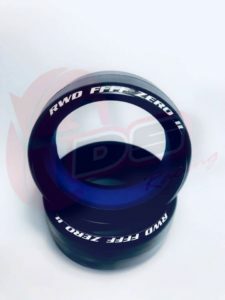 Effective as of today, the new Spec Tire is DS Racing – RWD FFFF Zero Mark II.